The month of May is Living Streets National Walking Month and with your help we want to build a map of all the different ways in which the streets of Gosforth could be made better for walking. We’ve included some examples and ideas below. If you know of somewhere in or around Gosforth that could be improved for walking please add it via the comments section and tell us where it is, what the issue is and/or any suggested solutions. We will add your ideas to our interactive map over the course of the month. By making it easier to cross busy roads or other ‘barriers’ to walking such as railway lines or rivers. Local improvements focused on areas where lots of people walk e.g. around schools or shops or where people work. Changes that help children, older people or people with disabilities. Reducing traffic speeds – e.g. by having narrower traffic lanes and/or tighter corners – or reducing traffic volumes. In recent posts we’ve written about improving the High Street for pedestrians, issues faced by the visually impaired and a plan for a more accessible crossing on the Great North Road, and there are plenty more places to look for inspiration. 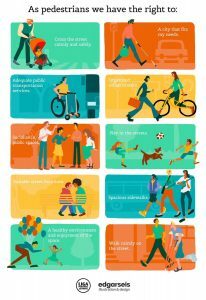 Living Streets have written a document Creating Walking Cities – A Blueprint for Change that says we should design ‘healthy streets; that are accessible and inviting to everyone, including disabled and older people, so everyone can enjoy walking and spending time there’. 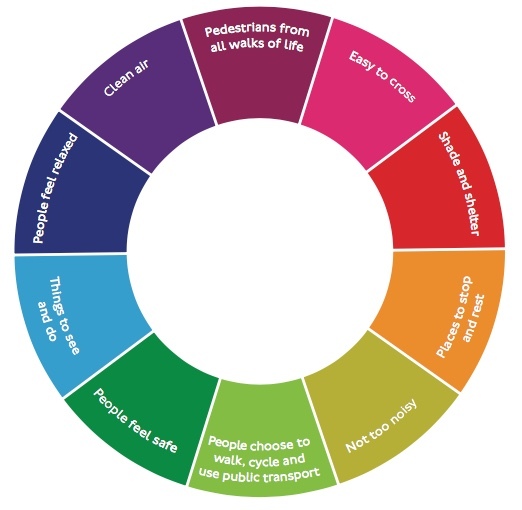 Transport for London in their Healthy Streets Guide include the following indicators for ‘healthy streets’ including being easy to cross, having shade and shelter, places to stop and rest and where people feel safe and relaxed. 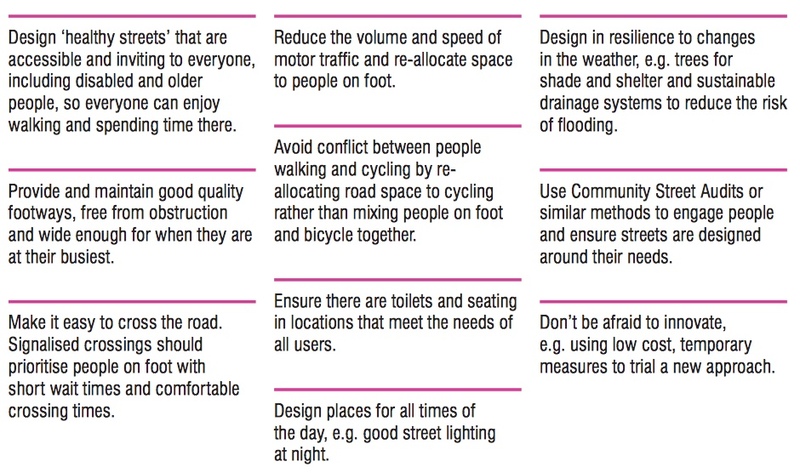 The Local cycling and walking infrastructure plans technical guidance and tools released alongside the Government’s Cycling and Walking Investment Strategy on 21 April also contains a long list of ideas for improving streets for walking, including how to determine and assess a walking network. The technical guidance says that walking routes should be attractive, comfortable, direct safe and coherent. 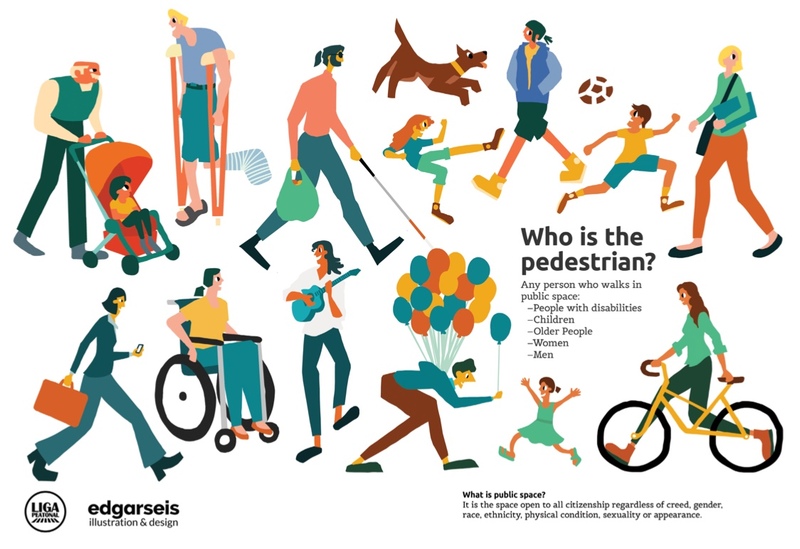 The ‘Who is the pedestrian?’ diagram at the top of this post was taken from an illustrated Charter of Pedestrian Rights drawn by Edgarseis, an illustrator and designer for sustainability, political participation, community-building, urban transport, and related projects. It is also more than just being about transport. Wikipedia defines ‘placemaking‘ as creating public spaces that promote people’s health, happiness and well being. The Project for Public Spaces says ‘Great public spaces are those places where celebrations are held, social and economic exchanges occur, friends run into each other, and cultures mix. They are the “front porches” of our public institutions – libraries, field houses, schools – where we interact with each other and government. When theses spaces work well, they serve as the stage for our public lives.’ They also have lots of advice for what makes great public space. Please use the comments section below to tell us your ideas for how we can make Gosforth’s streets better for walking. Please try to be as specific as possible. E.g. If you have an idea for how the improvement might be achieved e.g. a zebra crossing or tactile paving. You can also rate your walk on the Living Streets Website to help them build a national picture and potentially win a family city break. This entry was posted in Children, Gosforth High Street, Residents Views, Safety, Walking and tagged 20mph, children, feedback, pavements, Safe Routes to Schools, walking on April 30, 2017 by SPACE for Gosforth. The back lane next to Archibald Street school, has only one usable pavement due to the bins being left out on the other one. This makes it particularly difficult at the beginning and end of the school day when there are pedestrians and children on scooters/bikes going in both directions who all want to use the one narrow pavement. It would be unlikely to manage to get all the skips/bins removed, so one way to improve it could be to make the lane access only during the hours of e.g. 8.15-9.15am and 2.45-3.45. The zebra crossing on Salters Road needs some enforcement action-a car sped past me whilst I was pushing my baby in buggy and only narrowly missed me (I was half way across). The whole Western part of Salters Road is terrible for pedestrians. It’s hard to cross, with a very wide road, and very wide side road junctions also. There are pedestrian islands which do help a bit and make it possible, but these are not comfortable places to be with fast cars rushing passed at regular intervals. This is especially true having seen the island near the old hospital sit getting trashed last year in a crash. The Salters Road, Kenton Road Roundabout is also nasty for pedestrians. There is often a constant stream of traffic coming, from several directions. This means as well as looking left and right, you have to look behind you in case someone is turning the corner. This is the pedestrian route to two shops and a number of schools, and in addition the only way across the very wide Kenton Road to to the south, until you get to the Kenton Road/Elmfield roundabout, which is equally awful. “Imagine how nice it would be to have a path alongside the Ouseburn from Melbury to the Three Mile Inn. Please can we do something about Salter’s Road from the GNR to the post office? The pavement is so narrow walkers have to go in single file while there are three lanes of cars. It’s a very narrow road. Can it be made one way? Reducing the potential for conflict between people walking and cycling on the Town Moor shared path. Better links from the A1 underpass north of Acomb Crescent to Great Park west of the A1. Over-wide side road crossing at Meadowfield Road near Elgy Green. Wider crossings take more time to cross and put people at risk for longer. Shorter crossings with tighter corners encourage slower vehicle speeds and increase comfort and safety for people walking. Could we have a pedestrian entrance to South Gosforth School from Beatty Avenue without an increase in vehicle traffic? Use the centre of the Regent Centre roundabout as a public space e.g. with play equipment or benches for people to sit or eat their lunch on. This space can be made even bigger if the north / west sides of the roundabout were to be converted into roads with 2-way traffic. This would mean the current road SE of the island could be grassed over to link up with the pavement by Gosforth Pool. Make the Metro footbridge by Hunters Court more accessible (currently it has very steep steps) and provide a walking link into the industrial estate between the Metro lines from the bridge. Provide access to St. Nicholas playing fields from opposite Brackenfield Road. This would also help create a pedestrian route through Baronswood onto Jubilee Road avoiding Salters Road. Disappearing pavement & no dropped kerbs at corner of Emblehope Drive at the end of the path to the south of St. Nicholas hospital. Improvements for the old spider park at the top of Park Ave/Wansbeck Rd behind the houses just SE of the roundabout with Broadway West. Pavement parking on the east side of the Great North Road south of Broadway roundabout. Whilst safe crossings along the High Street are important, I think it’s also important to think about safe crossings on our residential streets. Many streets have junctions with back lanes or other streets where traffic speeds can be high. I often hear parents shouting at their children to stop when crossing a back lane. Raised crossings here, making sure that cars emerging at junctions have to do so slowly and considerately, would make a big difference to how safe people are when walking around the residential area. Speeding traffic in East Gosforth on Moorfield, The Grove and Hollywood Avenue. Speeding traffic on Elmfield Rd. Also, trying to cross the intersection at Parker Ave, Elmfield Rd and Westfield Drive – particularly in the morning- is awful. The dropped kerbs essentially lead you into the middle of the road, which mixed in with the cars that are usually speeding, means it is tricky to get across. We should be encouraging our children to walk to school by themselves as they get older but I’ve seen some near misses, where the child (middle school age) hasn’t actually even realised that they were almost hit! [Name deleted] good to see you championing common sense!! I miss Gosforth! Ciara. Walking around Gosforth is much nicer if you can get away from the pollution and noise of the main roads. I find the worst place is around the regents centre. You are either forced to walk on the pavement by the road or through the bus/metro station. It’s really awkward getting over the bus station to the Gosforth Theatre. This could be made more pedestrian friendly. The pavements around the entrance to the Regent metro are often slippy. Especially around the car ramps coming down from the upper floors of the car park. We find we often have to walk on the road as it’s flatter. Does this consultation extend to jesmond? Walking South from the RGS/Jesmond Metro there is a pedestrian underpass that looks like the entrance to the Gates of Hades. Very uninviting. Could do with being tidied, painted and lit properly if it’s to remain. There is a lot of drivers who don’t like the positioning of the North/South crossings on the Broadway roundabout. I would like to say that I am OPPOSED to these crossings being moved further away from the junction. This is because walkers will still want to cross near the roundabout as it’s the most direct route and this would end up being MORE dangerous as the traffic will not be expecting it and will be going faster at that point. How about turning the Regent C car park into a Park and Stride? A short, pleasant (if you take the back streets) and healthy walk into Gosforth High Street. Finally it is good to see a local group promoting and pushing issues with regards walking. Walking doesn’t tend to attract a specific budget yet 99% of us all use the footpath/way. what a shame the city council appear to do virtually nothing to promote either the ‘Walking Month’ or the ‘Walk to School’ week. Thanks Paul. Lots of good ideas there. Gosforth High Street would be a much more pleasant environment to walk along if the amount of heavy traffic were reduced. The noise and smell generated of the sheer number of busses (and HGVs) that use that route from the A1 into town make the whole experience very unpleasant and intimidating. We should look at ways of diverting busses which don’t serve High Street to more appropriate A roads or terminate at Regent Centre Metro and also encourage alternative fuels such as Hydrogen or Hybrid. Conerns shared via email about traffic in the back lane between Beatty Avenue and Honister Avenue.